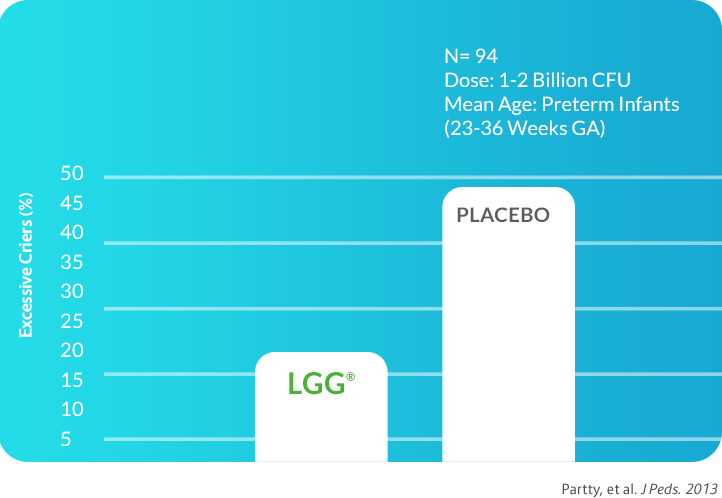 LGG® has been extensively studied in infants for a variety of outcomes including immune and gastrointestinal benefits. The probiotic strain helps train the immune system in early infancy to help reduce the incidence of atopic conditions. Additionally, by helping to balance the gastrointestinal microbiota, LGG® promotes digestive health. 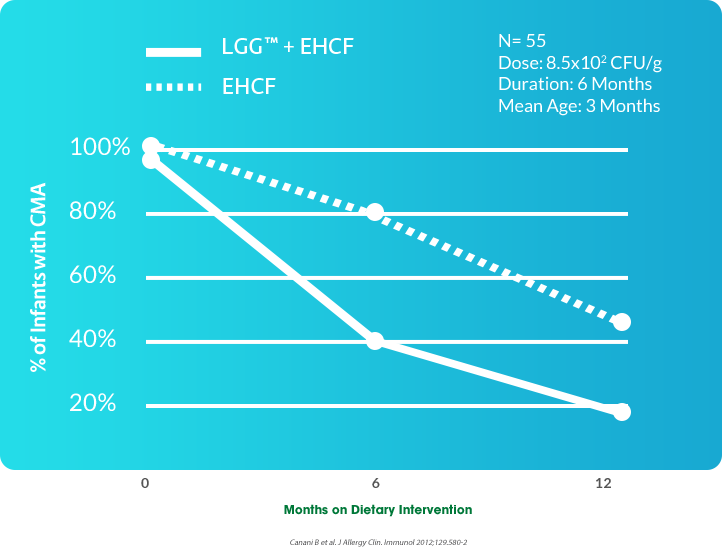 Though still emerging, early study indicates promising connections between LGG® and other benefits outside the immune and digestive systems. Findings suggest promising development of new strategies for reducing the incidence of ADHD and /or Asperger’s Syndrome. Similar to the research that indicates a connection between the gut microbiome, digestive health, and gastrointestinal disease, there is also data to indicate a strong gut-brain connection.15 Research finds pregnant mothers supplemented with LGG® prior to their due date and their newborn infants continuing the same intervention for six months, were found to be significantly less likely to be diagnosed by ADHD or Asperger’s Syndrome at age 13. According to the CDC, 1 in 9 child deaths worldwide are due to diarrheal disease. Acute gastroenteritis (AGE) causes inflammation of the gastrointestinal tract, affecting the stomach lining and the small intestine resulting in loose or liquid stools and/or increased frequency of evacuation, with or without fever and vomiting. AGE is caused by a range of factors including viruses, bacteria and parasites. 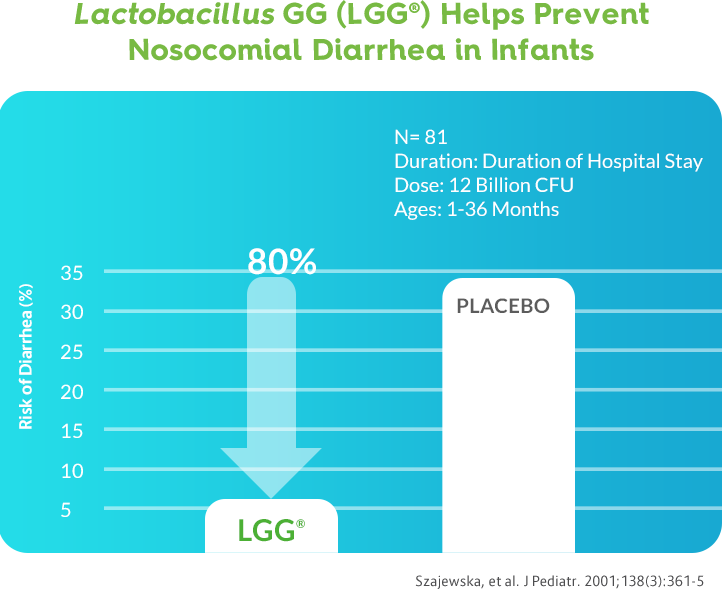 While supplementing with Lactobacillus GG during early infancy helps modulate the immune system and contributes to healthy development, supplementation at any point during infancy helps alleviate dysbiosis and has been clinically proven to reduce the incidence and duration of acute diarrheal infections,17-31 including rotavirus8,11,29-30 and nosocomial diarrhea,31 as well as antibiotic-associated side effects.24 These findings are supported by many clinical trials in older populations demonstrating similar results.32-36 Additonally, Lactobacillus GG has been shown to increase the lgA-specific antibody-secreting cell response to rotavirus in infants, leading to a rotavirus lgA serocoversion.8,26 This indicates that in addition to strengthening the epithelial barrier which contributes to pathogen exclusion and helps keeps infants healthy, Lactobacillus GG also boosts the adaptive immune response to rotavirus. Infantile colic is defined by crying that lasts for three or more hours a day, for three or more days a week, for at least three weeks.45 While the root cause of colic is not well understood, one hypothesis suggests that the disorder may stem from gastrointestinal dysfunction and allergy issues, such a s food allergy. 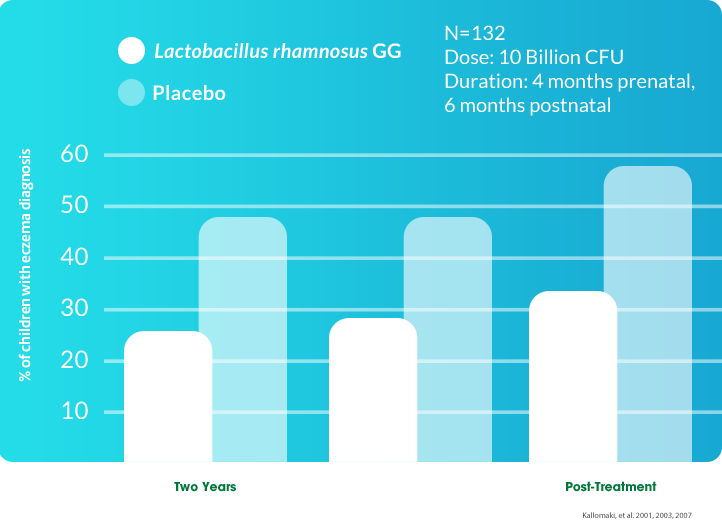 Luoto R, Isolauri E, Lehtonen L. Safety of lactobacillus GG probiotic in infants with very low birth weight:Twelve years of experience. Clin Infect Dis. 2010;50(9):1327-1328. Uberos J, Aguilera-Rodriguez E, Jerez-Calero A, Molina-Oya M, Molina-Carballo A, Narbona-Lopez E. Probiotics to prevent necrotising enterocolitis and nosocomial infection in very low birth weight preterm infants. Br J Nutr. 2017;117(7):994-1000. Nermes M, Kantele JM, Atosuo TJ, Salminen S, Isolauri E. Interaction of orally administered lactobacillus rhamnosus GG with skin and gut microbiota and humoral immunity in infants with atopic dermatitis. Clin Exp Allergy. 2011;41(3):370-377. Petschow BW, Figueroa R, Harris CL, Beck LB, Ziegler E, Goldin B. 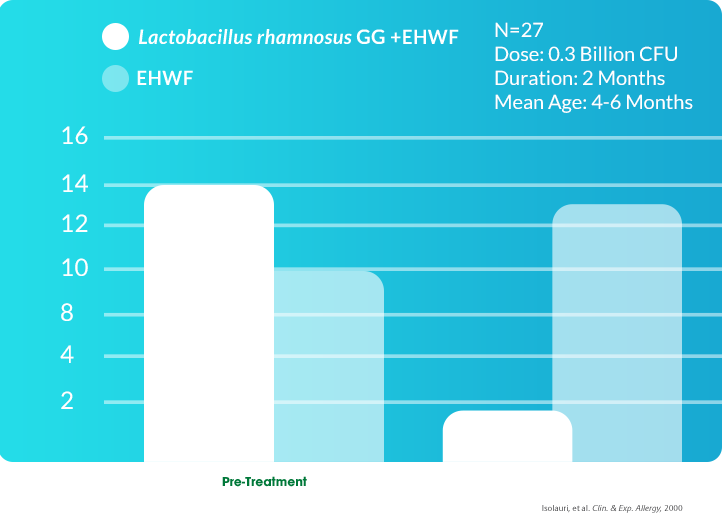 Effects of feeding an infant formula containing lactobacillus GG on the colonization of the intestine: A dose-response study in healthy infants. J Clin Gastroenterol. 2005;39(9):786-790. Millar MR, Bacon C, Smith SL, Walker V, Hall MA. Enteral feeding of premature infants with lactobacillus GG. Arch Dis Child. 1993;69(5 Spec No):483-487. Partty A, Luoto R, Kalliomaki M, Salminen S, Isolauri E. Effects of early prebiotic and probiotic supplementation on development of gut microbiota and fussing and crying in preterm infants: A randomized, double-blind, placebo-controlled trial. J Pediatr. 2013;163(5):1272-7.e1-2. Isolauri E, Arvola T, Sutas Y, Moilanen E, Salminen S. Probiotics in the management of atopic eczema. Clin Exp Allergy. 2000;30(11):1604-1610. Isolauri E, Joensuu J, Suomalainen H, Luomala M, Vesikari T. Improved immunogenicity of oral D x RRV reassortant rotavirus vaccine by lactobacillus casei GG. Vaccine. 1995;13(3):310-312. Oberhelman RA, Gilman RH, Sheen P, et al. A placebo-controlled trial of lactobacillus GG to prevent diarrhea in undernourished peruvian children. J Pediatr. 1999;134(1):15-20. Brouwer ML, Wolt-Plompen SA, Dubois AE, et al. No effects of probiotics on atopic dermatitis in infancy: A randomized placebo-controlled trial. Clin Exp Allergy. 2006;36(7):899-906. Kirjavainen PV, Salminen SJ, Isolauri E. Probiotic bacteria in the management of atopic disease: Underscoring the importance of viability. J Pediatr Gastroenterol Nutr. 2003;36(2):223-227. Manzoni P, Meyer M, Stolfi I, et al. Bovine lactoferrin supplementation for prevention of necrotizing Enterocolitis. Party A, Kalliomaki M, Wacklin P, Salminen S, Isolauri E. A possible link between early probiotic intervention and the risk of neuropsychiatric disorders later in childhood. A randomized trial. Pediatr Res. 2015:77(6):823-28. Canani RB, Cirillo P, Terrin G, et al. Probiotics for treatment of acute diarrhoea in children: Randomised clinical trial of five different preparations. BMJ. 2007;335(7615):340. Rautanen T, Isolauri E, Salo E, Vesikari T. Management of acute diarrhoea with low osmolarity oral rehydration solutions and lactobacillus strain GG. Arch Dis Child. 1998;79(2):157-160. Raza S, Graham SM, Allen SJ, Sultana S, Cuevas L, Hart CA. 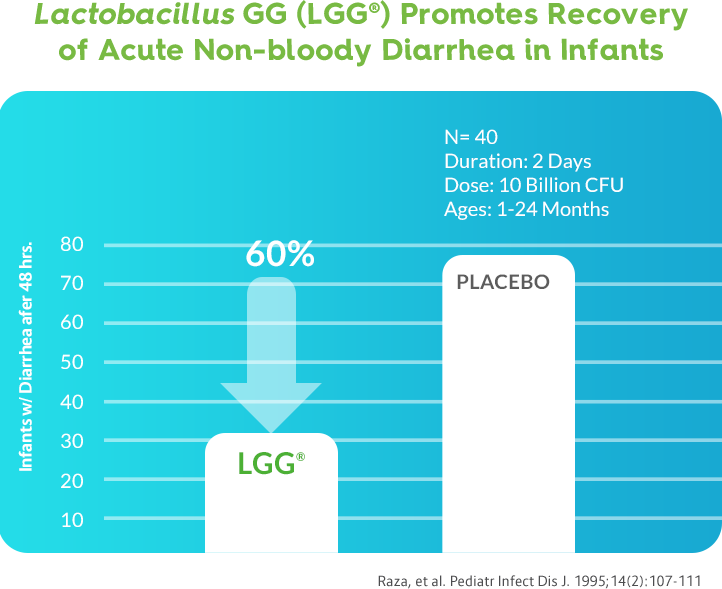 Lactobacillus GG promotes recovery from acute nonbloody diarrhea in pakistan. Pediatr Infect Dis J. 1995;14(2):107-111. Shornikova AV, Isolauri E, Burkanova L, Lukovnikova S, Vesikari T. A trial in the karelian republic of oral rehydration and lactobacillus GG for treatment of acute diarrhoea. Acta Paediatr. 1997;86(5):460-465. Isolauri E, Juntunen M, Rautanen T, Sillanaukee P, Koivula T. A human lactobacillus strain (lactobacillus casei sp strain GG) promotes recovery from acute diarrhea in children. Pediatrics. 1991;88(1):90-97. Sindhu KN, Sowmyanarayanan TV, Paul A, et al. Immune response and intestinal permeability in children with acute gastroenteritis treated with lactobacillus rhamnosus GG: A randomized, double-blind, placebo-controlled trial. Clin Infect Dis. 2014;58(8):1107-1115. Isolauri E, Kaila M, Mykkanen H, Ling WH, Salminen S. Oral bacteriotherapy for viral gastroenteritis. Dig Dis Sci. 1994;39(12):2595-2600. Armuzzi A, Cremonini F, Bartolozzi F, et al. The effect of oral administration of lactobacillus GG on antibiotic associated gastrointestinal side-effects during helicobacter pylori eradication therapy. Aliment Pharmacol Ther. 2001;15(2):163-169. Bennett R, Gorbach S, Goldin B, et al. Treatment of relapsing clostridium difficile diarrhea with lactobacillus GG. Nutrition Today Supplement. 1996;31(6):35S. Armuzzi A, Cremonini F, Ojetti V, et al. Effect of lactobacillus GG supplementation on antibiotic-associated gastrointestinal side effects during helicobacter pylori eradication therapy: A pilot study. Digestion. 2001;63(1):1-7. Umetsu DT. Flu strikes the hygiene hypothesis. Nat Med. 2004;10(3):232-234. Berni Canani R, Nocerino R, Terrin G, et al. Effect of lactobacillus GG on tolerance acquisition in infants with cow’s milk allergy: A randomized trial. J Allergy Clin Immunol. 2012;129(2):580-2, 582.e1-5. Berni Canani R, Nocerino R, Terrin G, et al. Formula selection for management of children with cow’s milk allergy influences the rate of acquisition of tolerance: A prospective multicenter study. J Pediatr. 2013;163(3): 771-7.e1. Dubois NE, Gregory KE. Characterizing the intestinal microbiome in infantile colic: Findings based on an integrative review of the literature. Biol Res Nurs. 2016;18(3):307-315.